MINOT, N.D. – Minot State University is currently accepting scholarship applications for the 2019-2020 school year. The deadline to apply is Friday, Feb. 15. 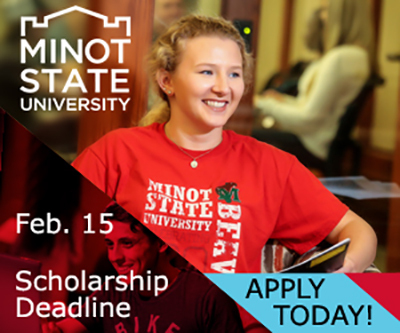 Minot State is offering the most scholarship dollars in school history, and a variety of scholarships are funded by gifts made to the University. Scholarships are based on academic achievements, financial need, and other criteria defined by the donors and vary depending on a student’s eligibility and availability of funds. “Scholarships play an important part in helping Minot State students achieve their educational goals in the most affordable way possible,” said Laurie Weber, director of financial aid. Over 300 scholarships and award programs are available through Minot State University, including the Transfer Student Scholar Award, Cultural Diversity Tuition Waiver, and Alumni Scholarship. Around 50 of these scholarships are audition or tryout based through the music department and athletic programs and follow a different application process. To apply, please visit Minot State’s Financial Aid website HERE. Not all colleges or departments use the online scholarship application. Students are encouraged to check with their college and/or department for additional scholarship information and visit HERE. In addition to submitting the 2019-20 Scholarship Application, students are encouraged to complete the 2019-20 Free Application for Federal Student Aid (FAFSA) HERE in order to be considered for federal student aid programs and need-based Minot State scholarships. Minot State also offers an Automatic 4-Year Award program for academically successful new freshman students. The combination of a student’s final unweighted high school GPA and best composite ACT or equivalent combined SAT score determines the award to students. For example, a student with an GPA above 3.8 and an ACT score over 30 may be awarded up to $12,000 over four years. New freshman students who are admitted to the priority deadline of July 1, 2019, for the 2019 fall semester will automatically receive the award. The general scholarship is not required for this program but newly admitted students may apply for additional Minot State scholarships by submitting the 2019-2020 Scholarship Application.